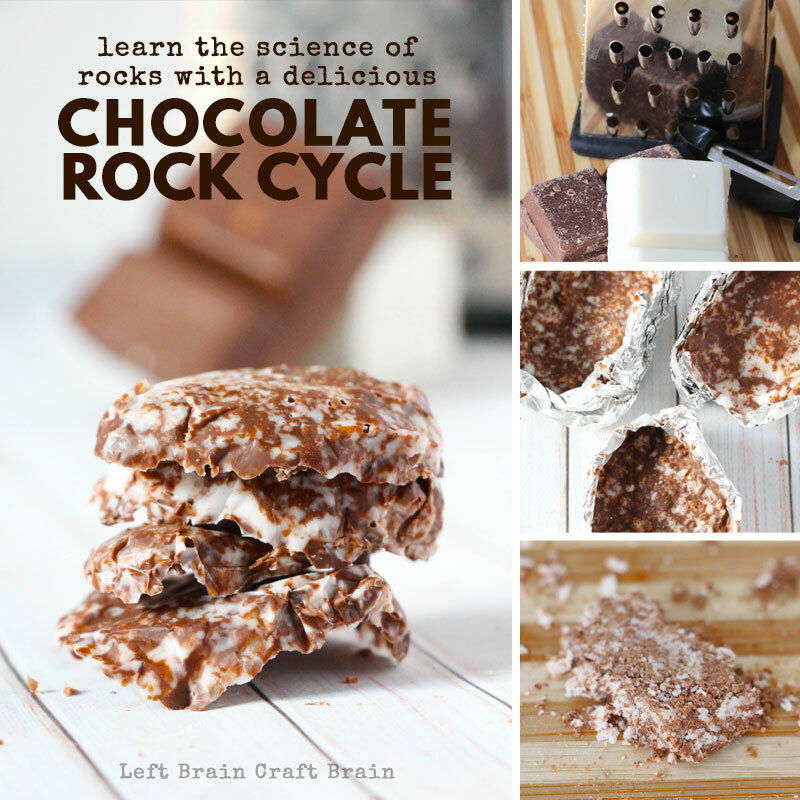 The kids will love learning about the science of rocks with this delicious rock cycle made of chocolate rocks. 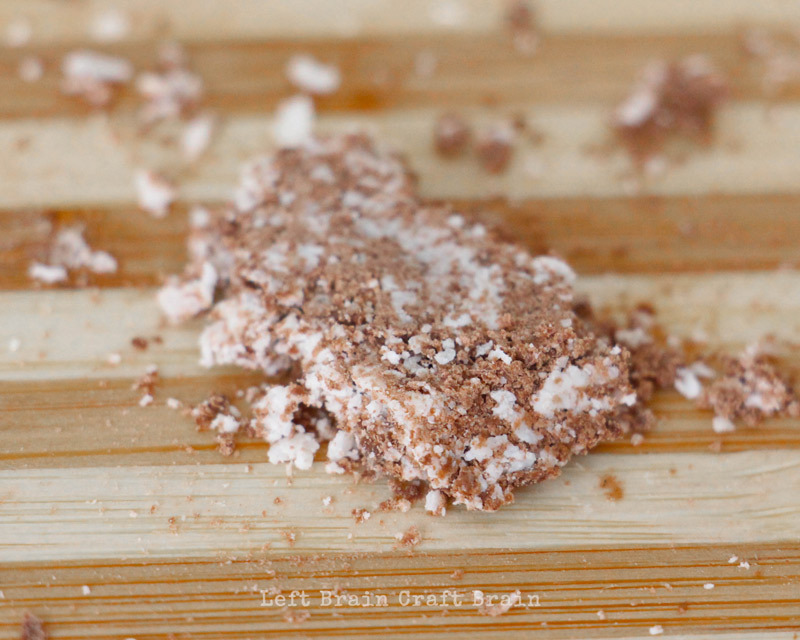 Chocolate shavings become sedimentary, igneous, and metamorphic types of rocks in this easy to follow science experiment. 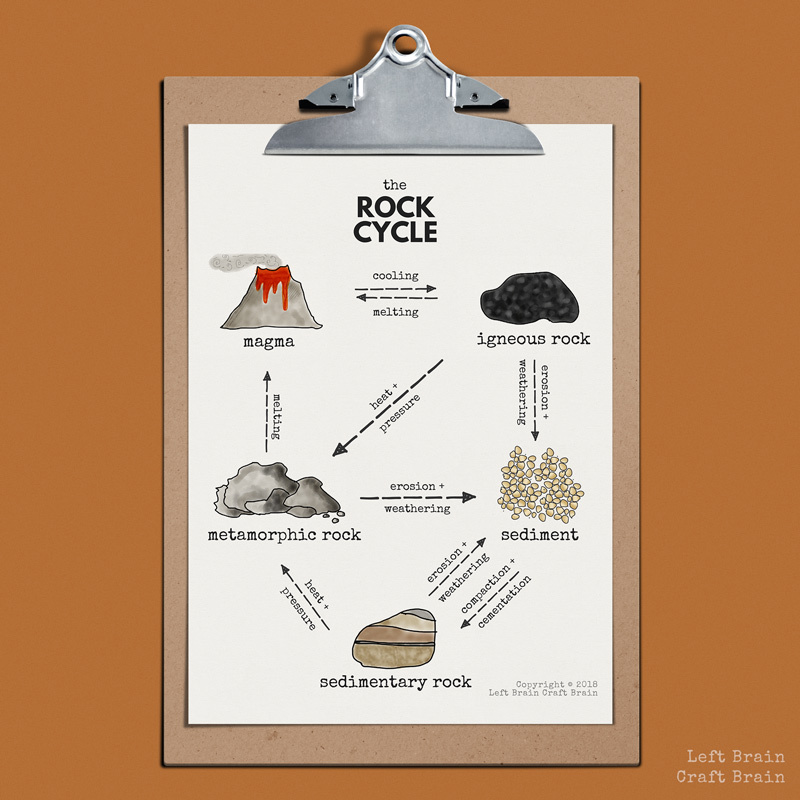 I’ve included a printable rock cycle diagram perfect for classrooms and homeschool too. What Types of Rocks Are There? The three main types of rocks on the earth surface are Igneous, Metamorphic, and Sedimentary rocks. Here’s a little bit more about them. What are Igneous Rocks? Igneous rocks are made from magma from the earth’s core or other rocks that have melted, crystalized, cooled, and hardened. Some examples of igneous rocks are basalt, pumice, and granite. What are Sedimentary Rocks? Sedimentary rocks are made up of sediment, small pieces of rock that have been broken apart by weathering or erosion. The rocks form when the sediment undergoes significant pressure, pushing the pieces together. This happens due to two processes: compaction (water and air between rocks is forced out) and cementation (hardening and welding of sediment with mineral crystals that form in the gaps). Some examples of sedimentary rocks are sandstone, limestone, and shale. This is the type of rock where fossils are typically found. What are Metamorphic Rocks? Metamorphic rocks are igneous or sedimentary rocks (and sometimes other metamorphic rocks, too) that have been exposed to a combination of heat, pressure, and mineral-rich fluids and the rock changes form. This process doesn’t melt the rocks, rather squishes, forces, or folds them into their new metamorphic form. Some examples of metamorphic rocks are marble, slate, and lapis. What is the Rock Cycle? Explore this Rock Cycle Diagram. The rocks we found on earth undergo what is called the rock cycle. It’s a view into the processes like erosion, cementation, and melting that rocks undergo on the eather surface. Here is a rock cycle diagram for you. Erosion and weathering are both responsible for the breakdown of rocks into smaller pieces. So what’s the difference between erosion and weathering? If the rocks break apart and move, it’s called erosion? But if the rocks breakdown and stay in place? It’s called weathering. Want a printable version of this rock cycle diagram? You can download it here. I’ve included one with fill-in-the-blanks spaces for kids to do as well. Here are our chocolate rocks and sediment! Now that we’ve explored the science of rocks, let’s get on to making some. Here’s what you’ll need to make the rocks. We are a participant in the Amazon Services LLC Associates Program, an affiliate advertising program designed to provide a means for us to earn fees by linking to Amazon.com and affiliated sites. For this project, you’ll step your way through the rock cycle demonstrated in the rock cycle diagram above. To start the process, we’ll be grating some chocolate as a makeshift erosion process. The chocolate block moves, so it’s called erosion, not weathering. 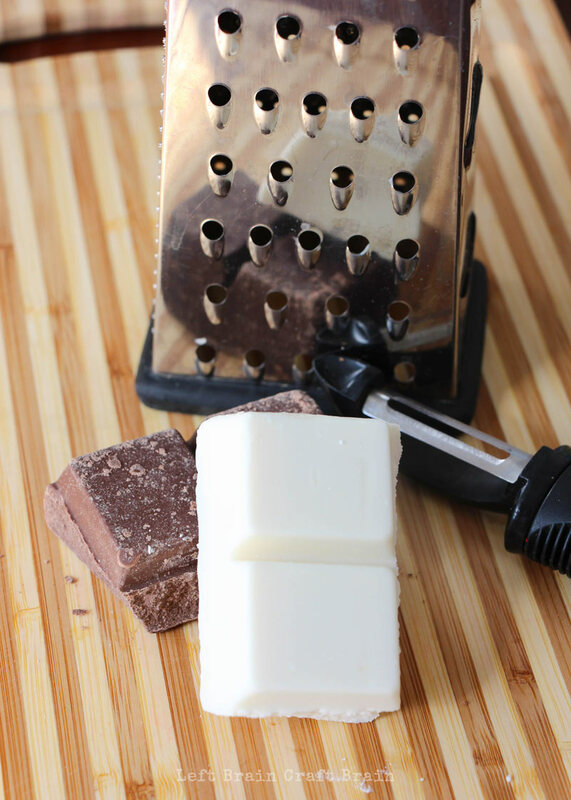 Use a cheese grater or vegetable peeler to carefully shave your chocolate. The cheese grater symbolizes erosion and weathering – wind, rain, etc. It is physically eroding the chocolate into smaller pieces, just like weathering forces do to larger bodies of rocks to form small rocks or even sand. 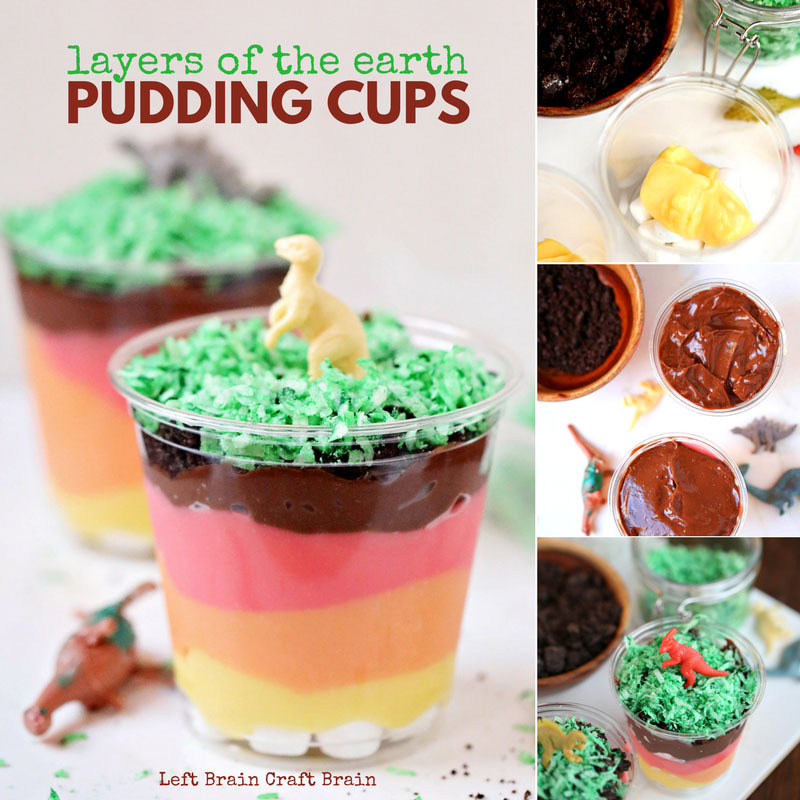 The small pieces of chocolate represent sediment. Notice the difference between the full blocks and the small shavings. 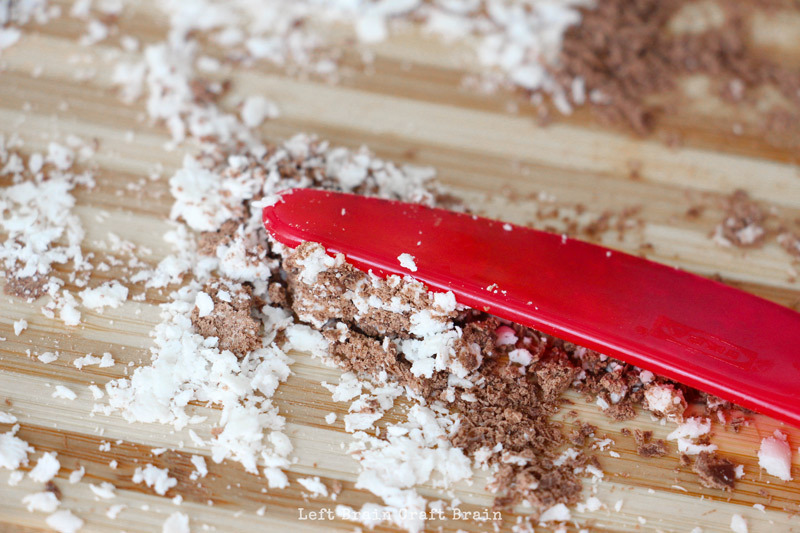 Take some of those small chocolate shavings and press them together to form a large clump. You may want to use a spoon, knife or a piece of tinfoil to do this as you’ll notice your fingers will start melting the chocolate. You are exerting pressure on the pieces of rock in order to form a sedimentary rock out of those pieces. Observe the newly formed sedimentary rock. What do you see? Take a few square pieces of tinfoil and form them into “rock molds.” You can do this with your fingers or actually wrap the tinfoil halfway around a rock to help you form the proper shapes. 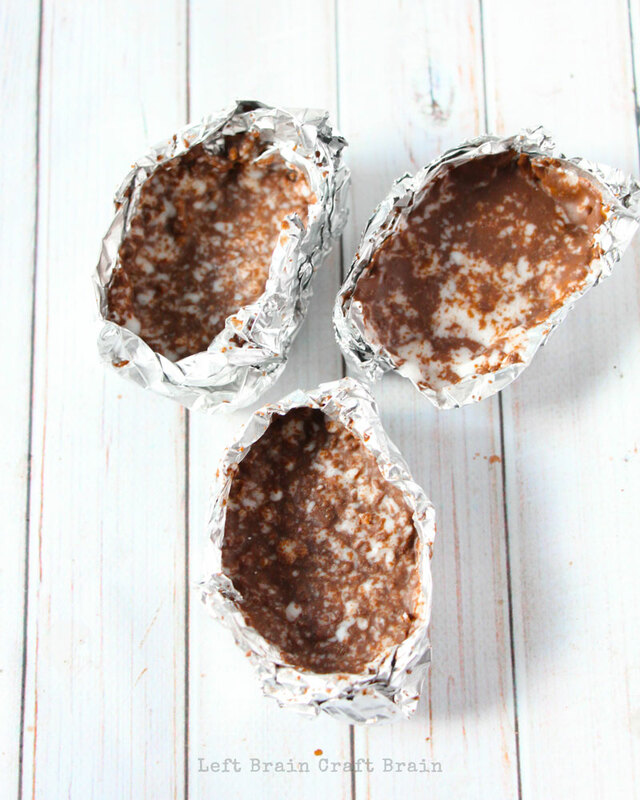 Take some of the remaining chocolate shavings and sprinkle them into the tinfoil molds. Place the molds on a candle warmer and heat until the chocolate is fully melted OR bake in the oven at 200F for about 3 minutes until melted. Let the chocolate completely cool and harden (you can quicken up this process in the freezer). Notice the differences between the sedimentary rocks and the metamorphic rocks. What different forces were exerted on those rock shavings to form the different rocks? How are they similar? 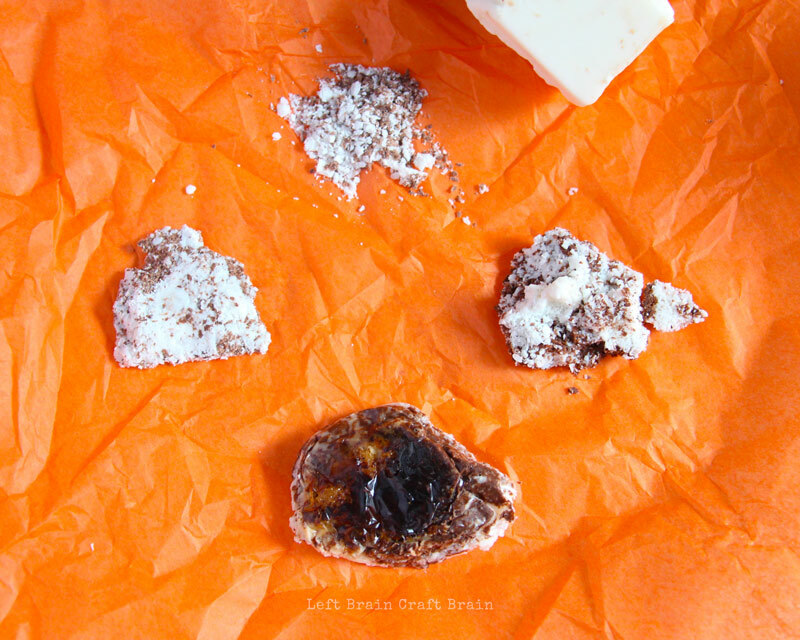 Since igneous rocks are made from magma, we want to melt the chocolate first. Adult supervision recommended for this step!! In the microwave, heat up a cup of water until almost boiling. 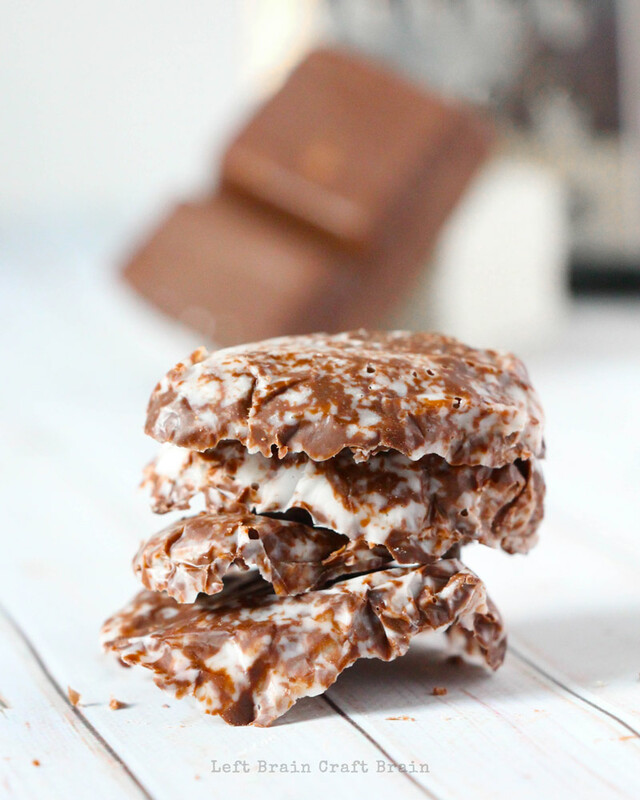 Wrap a square of chocolate in a piece of aluminum foil. 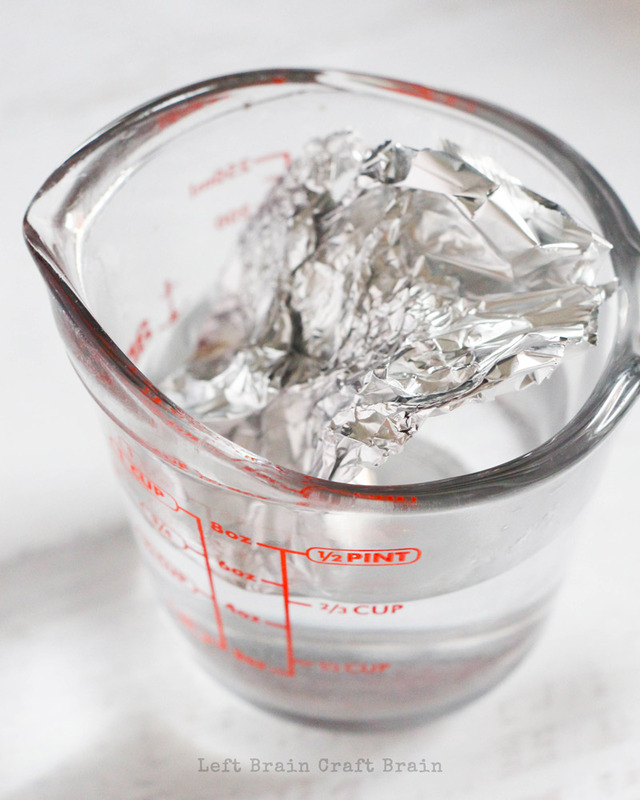 Place the foil packet in the cup of hot water. Let sit until melted, about 5 minutes. Then carefully remove the foil packet from the water, dry off and place in the refrigerator to cool until hardened, about 1 hour. Impatient? Pop it in the freezer for about 20 minutes instead. Unwrap the igneous chocolate rock from the foil. How does it compare to the sedimentary and metamorphic rocks? Here are the rocks all together! What are the Layers of the Earth? Or if you or the kids are just into rocks, be sure to try this awesome Buildable Rock Slime! It’s pretty much the most fun we’ve had with rocks, ever. 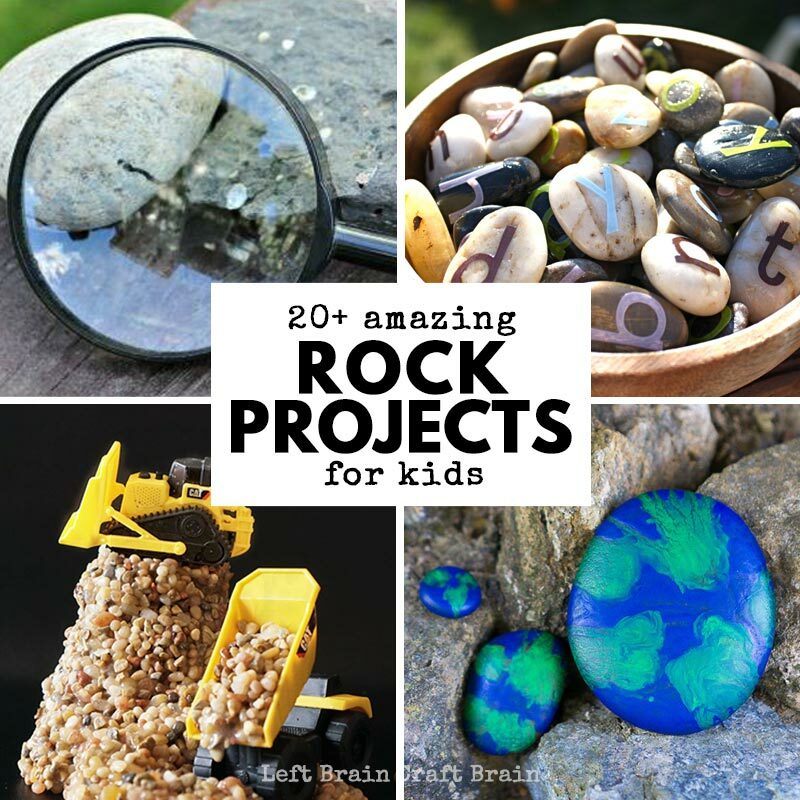 Or check out these other amazing Rock Projects for Kids. 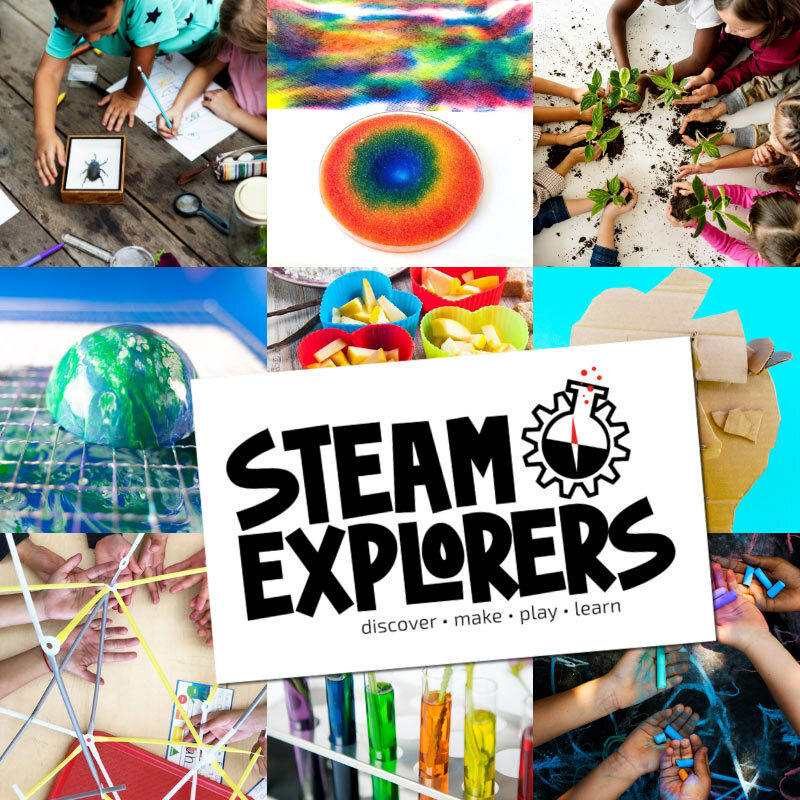 You’ll find more science, some arts and crafts, games, and more.